We all knew this was coming, though whether the first to market would be the frontrunner, E Ink, or one of its competitors, has always been up in the air. Other color e-paper technologies have been bumbling along for years; Fujitsu’s FLEPia jumped the gun on color e-readers way back in 2008, and technologies from Ricoh and Qualcomm might easily have taken the lead. But for now, it appears E Ink Inc. will maintain their grip on the e-reader market. Their Pearl greyscale displays are in all the major e-reader devices, and chances are that will continue to be the case for some time, as they have introduced a color e-paper display for commercial use well before their competition. Their new Triton display will come in 5-, 7-, and 10-inch varieties, and E Ink seems to think that it will be instrumental in establishing digital newspapers and periodicals. It can display “thousands of colors,” specifically 4096; it’s not clear whether that number is effective or absolute — that is to say, whether it takes into account the shades created by the 16 greyscale stages. Either way, it’s a limited but not severely limited color space for books and magazines. Battery life seems to have stayed steady, which makes sense. I’m concerned with the readability. By adding an RGB filter, you’re necessarily reducing reflectance, contrast, and possibly resolution. The newest e-ink screens have admirable sharpness and passable resolution, but I don’t know if that will translate to the new color devices (the stated specs are nearly identical, but I think in practice it will look different). 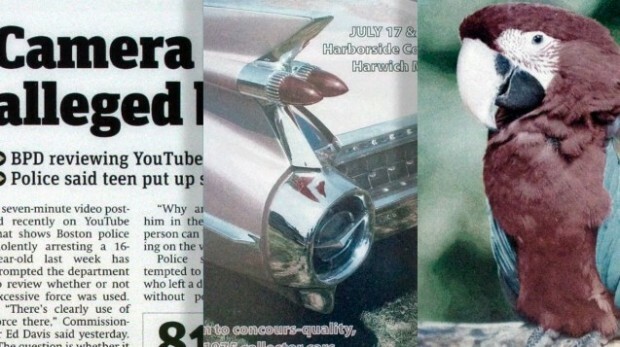 As you can see above and in the Hanvon reference model at top, the color is extremely desaturated even in their carefully presented press shots. The ability to backlight color in LCDs has led to an expectation of vibrancy far beyond what this first generation of color e-paper can provide. For that reason I doubt that Amazon, Barnes & Noble, or any of the other major e-reader makers will adopt Triton. It would be a dangerous maneuver, putting their devices closer to the iPad and other tablets, which in a hands-on comparison will take color e-readers to school. The tablet vs. e-reader debate will shape itself over the next few months as credible competitors to the iPad finally appear, and I think we’ll find a solidifying of the capabilities and technologies that distinguish the two. I have my own opinions, but they don’t signify when the industry itself hasn’t decided what makes a device what. It’s impossible to make a judgment, however, until we see these things in real life, in their final forms. No doubt we’ll see them at CES, and probably before — so we’ll post a hands-on as soon as that happens. But like the first generation of e-paper, which was pretty weak, Triton will have to serve as a wedge and an indicator of things to come rather than a complete technology. Don’t expect it on our shores for some time, at least not in any of your familiar brands. E Ink color ePaper displays enabled by Triton Imaging Film will deliver high-contrast, sunlight readable, low-power performance that will revolutionize the market. MAKUHARI MESSE, Japan–(BUSINESS WIRE)–E Ink® Holdings Inc., the leader in electronic paper display technology, today announced the release of its next generation display technology, E Ink Triton. Triton enables color ePaper solutions, enhancing the visual experience for ePublishing markets. For image-rich information applications showing charts, graphs, maps, photos, comics and advertising, color displays made with Triton Imaging Film enable ultra-low power and high mobility devices with a paper-like experience. In addition to 16 levels of grayscale, Triton is capable of displaying thousands of colors. And just like E Ink’s grayscale ePaper products, Triton’s crisp text and detailed color graphics are fully viewable in direct sunlight. Displays made with Triton, as well as the recently launched Pearl, can perform up to 20 percent faster than those made with previous generations of E Ink Imaging Film. Whether turning a page, selecting a menu, taking notes, or viewing simple animations, Triton’s update performance will satisfy today’s user-interface product needs. This expands the ePaper experience and displays more dynamic content for signage or advertising. 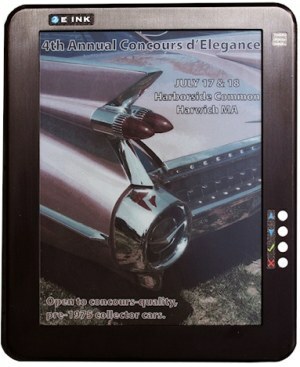 The E Ink Triton design leverages the patented two pigment capsule platform found in millions of E Ink enabled eBooks. This technology offers unparalleled image stability; pictures and text can be maintained on the screen even when the power is turned off. With this proven bi-stable technology, devices using E Ink Imaging Film have demonstrated both long life and high reliability, leading to the development of a whole new class of consumer products over the past few years.